Montañola-Sales, C.; Casanovas, J.; Cela, J.; Kaplan, A.
Agent-based modeling and simulation is a promising methodology that can be used in the study of population dynamics. We present the design and development of a simulation tool which provides basic support for modeling and simulating agent-based demographic systems. Our results prove that agent-based modeling can work effectively in the study of demographic scenarios which can help to better policy planning and analysis. Moreover, parallel environment looks suitable for the study of large-scale individual-based simulations of this kind. Montañola-Sales, C., Casanovas, J., Cela, J., Kaplan, A. 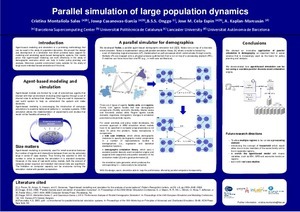 Parallel simulation of large population dynamics. A: Winter Simulation Conference. "Proceedings of the 2013 Winter Simulation Conference". Washington: 2013, p. 1.